Healthy plant-milk from healthy trees grown in healthy soil, a blue print for a brighter future. ‘We enthusiastically apply regenerative farming techniques as we learn them. As a food maker, understanding we can actually create new soil, conserve water, and work with, not against, natural processes is invigorating,’ says CEO Jim Richards. Milkadamia is a delicious non-dairy macadamia nut milk with a subtle, smooth flavor and beautiful milky creaminess. It is a great new adornment to smoothies, muesli, baking and to your morning coffee. Milkadamia is crafted with care and flair to support the wellness of its users and the Earth. ‘Milkadamia’s on pack statements “Free-Range Trees” and “Moo is Moot” create a little billboard on the breakfast table, nudging our thoughts towards the power of each of our food purchases.’, said Jim Richards, CEO of Milkadamia. At Milkadamia’s family-run farms in Australia, macadamia trees flourish in their natural habitat. ‘We enthusiastically apply regenerative farming techniques as we learn them. As a food maker, understanding we can actually create new soil, conserve water, and work with, not against, natural processes is invigorating.’, says Richards. Milkadamia is part of a quiet agricultural revolution among proactive farmers who are increasingly adopting regenerative farming techniques. Creating new fertile top-soil each year is the prime objective of regenerative farming. Healthy soil swarms with microorganisms that flourish into astounding abundance in undisturbed soil. They in turn create vital nutrients for our food, and importantly draw and store very, very significant quantities of carbon from the sky. ‘We cannot at this point in Earth’s history, be satisfied with simply maintaining the status quo – our agricultural landscape overexploited and nutrient-exhausted. Milkadamia believes regenerative farming can take us far beyond the rather unremarkable goal of mere sustainability. We’re radically optimistic that healthy soil can play a significant role in reversing worrying global trends, and is the key to growing healthful plants in the abundance we will need tomorrow. We're thrilled to be a small part of a new wave of farming that allows an abundant future for our planet, and we invite everyone to preferentially choose foods that support regenerative agriculture practices.’, says Richards. The day to day life in the farm utilizes interesting, ‘beautiful’ regenerative farming techniques such as leaving Mohawk strips in the middle of rows of trees for the benefit of tiny, native pollinator bees and insects. Using non-invasive methods like breeding owls and fox terriers to naturally curtail pests and using small native wasps to patrol for the destructive Lace Wing as an alternative to chemical sprays. ‘However, this regenerative farming can look unkempt – where traditional orchards are neat rows of trees on manicured lawn - our orchards appear a wild tangled abundance of untamed green. There is real beauty in this rural scenery, just not of the trimmed fields variety, it is instead a riotous rhapsody of living things both upon and within the soil.’, says Richards. Milkadamia’s farms plant thousands of trees each year helping to reforest areas previously cleared for dairy farming. As part of their commitment to water conservation, their trees are watered solely by the natural rainfall. Milkadamia is available in the shelf stable section of over 5,000 retailers in the US. Retail locations include Whole Foods, Wegmans, Meijer, Safeway, Natural Grocers, Sprouts, HEB and more, as well as e-commerce including Amazon, Jet.com and Thrive Market. 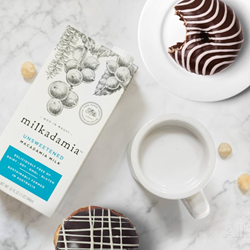 Milkadamia comes in three flavors: Original, Unsweetened, and their newest one, Unsweetened Vanilla. Milkadamia also has a barista blend called Latte Da, used in more than 2,000 coffee shops around the country. Milkadamia’s new line of refrigerated milks will be debuted in Walmart in January ’18. Learn more about milkadamia by checking out their website milkadamia.com and their Instagram @milkadamia.